I am really excited to tell you about a little "get together" some of ladies from the Philly Social Media Moms are having. It's called the Progressively Perfect Dinner Party. 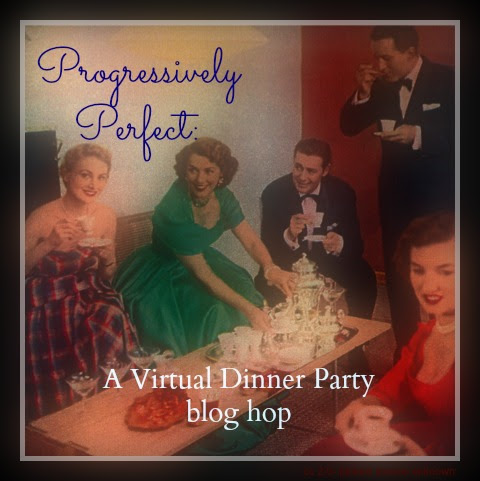 Our Party is based on In Real Life Progressive Dinner Parties that start at one house for Appetizers and travel from place to place for each course until drinks afterward. We thought, "Why couldn't we have one where you hop from blog to blog?" Please take a look a the links below to follow the party from course to course! You are here to have one of my family's favorite fall-back appetizers: The Chili Layered Dip. It is SUPER easy and always delicious. A little smooth and creamy and a little hot and spicy-YUM! Press softened cream cheese into 12" x 12" glass pie dish. Next pour the chili on top of the cream cheese. Lastly, layer with the shredded cheddar cheese. Microwave for 3 minutes or until cheese has melted. This sounds tasty! Does not help that I have not eaten lunch! Looks like a great hot app! This sounds easy and delicious. Sounds perfect for our next girls night in. LOVE Mexican food - totally going to make this! This looks really yummy! I love a good way to use up leftover chili too! i love dips like this, cheesy, hot and gooey!